Apple is nearing a deal to build a major A$50 million store in the Australian city of Melbourne, a report said on Tuesday. Apple on Thursday published its annual holiday gift guide, this year putting an even stronger marketing spotlight on its core products. Black Eyed Peas frontman will.i.am -- along with models Kendall Jenner and Naomi Campbell -- has launched a new set of earbuds, the i.am+ Buttons, available at Apple stores as well as a number of other U.S. retailers like Neiman Marcus and Bloomingdales. At least some Apple stores across the U.S. -- including its Union Square outlet in San Francisco -- reportedly set up line barriers on Wednesday night, and/or saw unusual activity behind their glass facades. After a year of renovations, the Regent Street Apple store in London is opening on Oct. 15, and members of the press were given a sneak peek of the interior prior to the big day. A number of Apple store workers in Australia have been implicated in a scandal involving photos of female customers and staff -- including ones allegedly stolen directly from customers' iPhones. A Facebook photo leaked by a construction worker appears to show the interior of Apple's Regent Street store in London, which is due to reopen on Oct. 15 after over a year of renovations. Having been under renovations for over a year, Apple's flagship U.K. store in London will finally reopen on Oct. 15 at 10 a.m., the company has announced. A disgruntled customer, upset at perceived slights by Apple support, has used a steel ball to smash assorted products inside the Dijon, France Apple retail store. 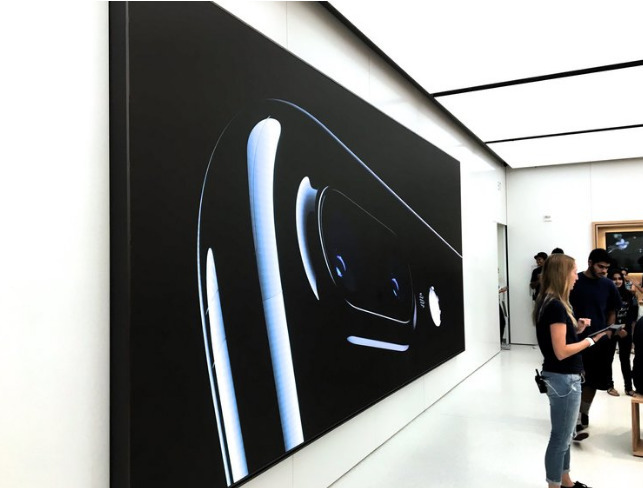 Apple is set to reopen four U.S. stores on Sept. 24, scattered across the states of Arizona, California, and Virginia. On the same date, the company will open a new outlet in Birmingham, England, replacing an earlier location. Apple is preparing to reopen three retail stores on Friday after months of renovations, sprucing them up just in time for the launch of the iPhone 7.